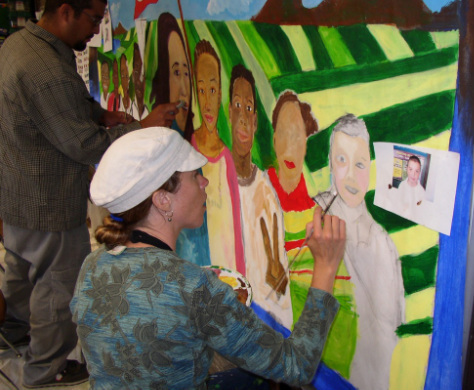 Brenda Miller Holmes is a muralist, artist and educator that has been facilitating collaborative community mural projects throughout the San Francisco Bay Area, the North Carolina Triangle and internationally for more than 15 years. For 7 years she studied and worked with Master Muralist Susan Kelk Cervantes of Precita Eyes Muralists in San Francisco, where she was trained in an artistic approach that mirrors the principals of Popular Education. Brenda’s interest lies in the intersection of art, community empowerment and social justice and she is passionate about sharing unifying and transformative collaborative experiences. Beyond her collaborative work, her art practice spans a variety of media. As an educator, she facilitates workshops with people of all ages and works as an independent consultant on community engaged public art initiatives.